Le Corbusier placed systems of harmony and proportion at the centre of his design philosophy, and his faith in the mathematical order of the universe was closely bound to the golden section and the Fibonacci series, which he described as “rhythms apparent to the eye and clear in their relations with one another. And these rhythms are at the very root of human activities. They resound in Man by an organic inevitability, the same fine inevitability which causes the tracing out of the Golden Section by children, old men, savages, and the learned. Note: All golden ratio lines shown on images on this page were created with PhiMatrix Design and Analysis software and are accurate to within one pixel. Le Corbusier conceived a tall central building that would house all the Secretariat offices. Le Corbusier’s plan, known as project 23A, was taken as the basis for the design. Niemeyer’s scheme 32 was approved by the Board of Design, but he eventually gave in to pressure by Le Corbusier, and together they submitted project 23/32 (developed with Bodiansky and Weissmann), which combined elements from Niemeyer’s and Le Corbusier’s schemes. Niemeyer said his architecture was strongly influenced by Le Corbusier. In 1936, the architecture firm Niemeyer worked for, Lucio Costa, was awarded a contract to design the new headquarters of Brazil’s Ministry of Education and Health in Rio de Janeiro. Costa invited Le Corbusier to be a consultant on the project, and Niemeyer joined the design team. The building they created also appears to have golden ratios in its design. The building features golden rectangles in the columns of its colonnade, and three vertical golden rectangles adjoined horizontally in the interior entry. This is shown by the red lines in the above images. The interior entry appears to use the same concept of proportion in design as the three horizontal golden rectangles adjoined vertically in the UN Secretariat Building’s height and width, as illustrated in a following section of this article. Given all this as a foundation, it certainly would not be surprising to find golden ratios in the collaborative design of the UN Secretariat building by Le Corbusier and Niemeyer. To the contrary, it would seem almost inevitable, but let’s not stop there. You can watch the entire video of Donald in Mathmagic Land here, and find the UN Building scene at the 10:21 minute mark: http://www.youtube.com/watch?v=ELjEM4C2QSQ So with Le Corbusier, Oscar Niemeyter, Walt Disney and Donald Duck all backing the golden ratio, it must be the basis for the design of the UN Building, right? The debunkers still say no, so let’s test it. The height of the building varies somewhat due to the variation in elevation between street level and river level. It is 505 feet tall on the west side street entrance level. The east side river level shown in the Disney move illustration is 544 feet tall. The width of the building is 287 feet and its depth is 72 feet. The Disney film illustrates three golden rectangles stacked on top of each other, so let’s do the math. If the width of the golden rectangle is 287 feet, its height is 287 divided by 1.618 or 177.4 feet. Three golden rectangles stacked on top of each other would be 177.4 times 3, which is 532.2 feet. The golden ratio is an irrational number that cannot be expressed in integers. Architects are faced with a number of real world constraints that are based on integers, such as the number of floors and windows. They also face constraints set by various building standards for standard dimensions of construction materials, such as drywall and building framing components. There are the engineering constraints required to construct a stable, lasting 500 foot skyscraper that take precedent over its artistic design elements. Even with these constraints, there are many golden ratios in its design, as presented below. The Disney film seems to imply though that the two horizontal dividing lines on the face of the building divide the building in equal thirds. This, however, is a simplification of the actual design dimensions, and perhaps a source of the confusion as to whether the building is based on the golden ratio. Let’s explore further. As much as Corbusier may have loved the golden ratio, you can’t easily divide a 505 foot building by an irrational number like the golden ratio, 1.6180339887…, into its 39 floors and have them all come out equal in height and exactly at a golden ratio point. The building was designed with 4 noticeable non-reflective bands on its facade, with 5, 9, 11 and 10 floors between them. Interestingly enough, this configuration divides the west side entrance to the building at several golden ratio points, illustrated with PhiMatrix software in the photos below. An interesting aspect of the building’s design is that these golden ratio points are more precise because the first floor of the building is slighter taller than all the other floors, and the top section for mechanical equipment is also not exactly equal to the height of the other floors. The photo on the left shows lines based on Le Corbusier’s Modulor system, which are created when each rectangle is 1.618 times the height of the previous one. The photo on the right shows the golden ratios lines which are created when the dimension of the largest rectangle is divided again and again by 1.618. Both approaches corroborate the presence of golden ratio relationships in the design. Click on either image to see the full size version. The photo on the left illustrates a Modulor progression in golden ratio dimensions, starting with the height of the entrance and building to the bottom of the first two dividing lines. In the photo on the right, the first golden ratio point defines the middle of the second non-reflective band. This is based on the height from the base at street level to the top of the building, as illustrated by the green lines. How was this achieved? The building has 39 floors, but the extended portion for mechanical equipment on the top makes it about 41 floors tall. 41 divided by 1.618 creates two sections of 25.3 floors and 15.7 floors. The golden ratio point indicated by the red lines is midway between the 15th and 16th floors, or 15.5 floors from the street. This means that the building was designed with a golden ratio as its foundation. Approximately 41 floors ÷ 1.618² ≅ 15.7 floors, and the visual dividing line is midway between the 15th and 16th floor. A second golden ratio point defines the position of the third of the four non-reflective bands. This is based on the distance from the top of the building to the middle of the first non-reflective band, as illustrated by the yellow lines. Approximately (41 – 5.5 floors) ÷ 1.618² ≅ 21.9+5.5 floors ≅ 27.4 floors, and the visual dividing line is midway between the 26th and 27th floor. A third golden ratio point defines the position of the first and second of the four non-reflective bands. This is based on the distance from the base of the building to the top of the second non-reflective band, as illustrated by the blue lines. Mathematically, the 16 floors would be divided by 1.618 to create an ideal golden ratio divisions of 9.9 floors and 6.1 floors. This second dividing line on the building is at the 6th floors. 16 floors ÷ 1.618² ≅ 6.1 floors, and the visual dividing line is at the 6th floor. The columns that surround the center area of the front entrance are placed at the golden ratio point of the distance from the midpoint of the entrance to the side of the entrance. The large open framed areas to the left and right of the center entrance area are golden rectangles. The doors on the left and right side of the center entrance are golden rectangles. The left and center frame sections of the center section is a golden rectangle. Click on the photo below for a larger version. 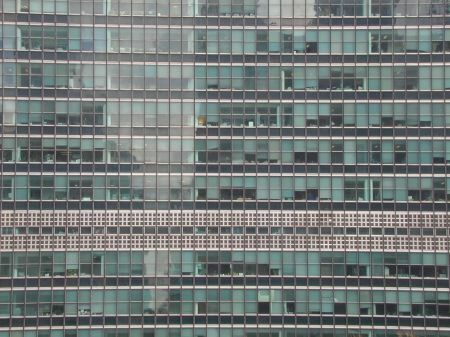 Many have sought to “debunk” the application of the golden ratio in the design of the UN Building. Most who do either say there is “no evidence at all” or reference a “debunking” article” by a Harvard Ph.D. in Mathematics. This Harvard Ph.D. correctly points out in the article that the simple ratio of the height to width of the building is 505/287 or 1.76, which is not the golden ratio. He stops there, however, apparently not knowing the history of the architects, missing the concept of the three stacked golden rectangles, and not considering the clear dividing lines in the design of the face of the building, or the details in the design of its curtain wall, windows and doors. As illustrated by the intricate nesting of golden ratios in his Modulor design template, Le Corbusier’s passion and vision for the golden ratio was far more sophisticated than to design a building in the simple shape of a golden rectangle. We just need an open mind and a tool like PhiMatrix to do the analysis required to understand his thinking, and appreciate the intricate beauty of his creation. I welcome any additional evidence from anyone who after reading this article still thinks that there is no evidence for the golden ratio here, or that the Markowsky analysis was accurate. The information presented here is as accurate as I could find. I even called the UN to ask for scale drawings or blueprints of the Secretariat building to do more exacting measures than are possible with high resolution photos and basic math. I was told that the UN didn’t have this information and that I should search on Google. Do you agree with the above evidence and conclusions? Comment below and let both golden ratio enthusiasts and debunkers know. Many who have a vested interest in debunking anything that might imply there may be design in nature or in mathmatical relationships. They attempt to do this by arbitrarily selecting points of measurement that do not support such elegant relationships as those shown in the phi construct. Very astute observation. The dividing line on the stone falls at the golden ratio point between the top and bottom of the stone’s text. Didn’t Le Corbusier or Niemeyer leave some written documents with the measures and the places where golden proportions were stated? They may have, but I’ve not been able to find any such references. The best evidence that the design embodies the golden ratio is in the measurements themselves, and the fact that Le Corbusier introduced a golden ratio-based design system just several years before participating on the UN project. The Golden Ratio is mankind’s answer to nature in balance. I see the world reflecting the errors of modern architects’ styles, imbalance, lop-sidedness and maintenance nightmare they have created. For example the Scottish Parliament Building. I expect they will only last as long as maintenances bills are paid.